A number of recent studies have combined multiple experimental paradigms and modalities to find relevant biological markers for schizophrenia. In this study, we extracted fMRI features maps from the analysis of three experimental paradigms (auditory oddball, Sternberg item recognition, sensorimotor) for a large number (n = 154) of patients with schizophrenia and matched healthy controls. We used the general linear model (GLM) and independent component analysis (ICA) to extract feature maps (i.e. ICA component maps and GLM contrast maps), which were then subjected to a coefficient-constrained independent component analysis (CCICA) to identify potential neurobiological markers. A total of 29 different feature maps were extracted for each subject. Our results show a number of optimal feature combinations that reflect a set of brain regions that significantly discriminate between patients and controls in the spatial heterogeneity and amplitude of their feature signals. Spatial heterogeneity was seen in regions such as the superior/middle temporal and frontal gyri, bilateral parietal lobules, and regions of the thalamus. 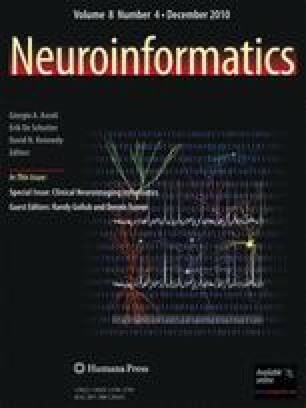 Most strikingly, an ICA feature representing a bilateral frontal pole network was consistently seen in the ten highest feature results when ranked on differences found in the amplitude of their feature signals. The implication of this frontal pole network and the spatial variability which spans regions comprising of bilateral frontal/temporal lobes and parietal lobules suggests that they might play a significant role in the pathophysiology of schizophrenia. This work was supported by the National Institutes of Health; Contract grant number: 1 RO1 EB 006841. We would like to personally thank Christopher Abbott for his insightful comments on this manuscript.